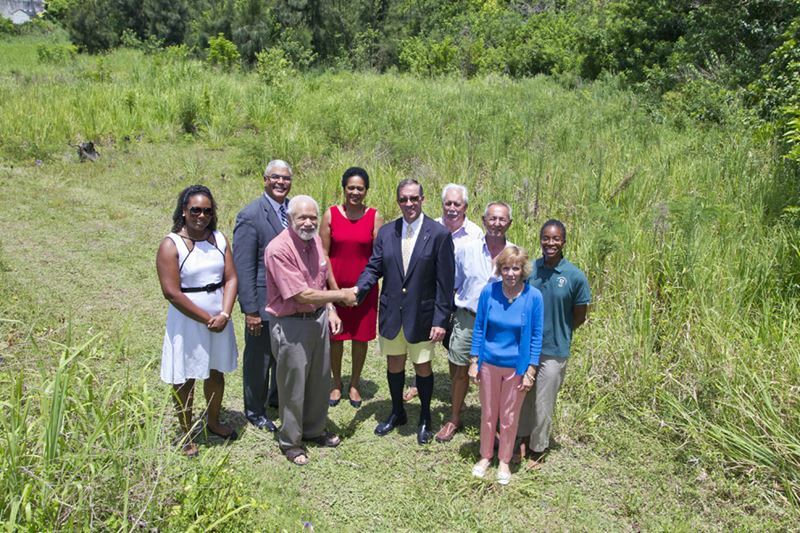 [Updated] Earlier today [July 1], Premier Michael Dunkley and Minister of Public Works Craig Cannonier joined Dr. Kuni Frith-Black and the Friends of Southlands for a ground breaking ceremony at site of the new community garden in the Southlands Park in Warwick. 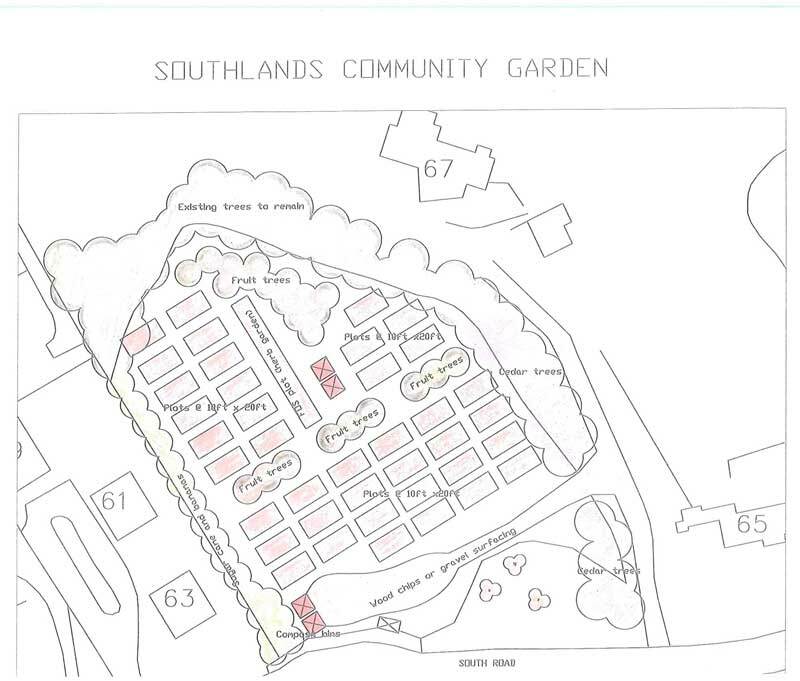 The community garden, which is spearheaded by the Friends of Southlands, is slated to open in the Fall of 2015 and applications to rent a space will be available through the Friends of Southlands in mid September. The garden will be situated at the western entry to Southlands Park, on South Shore Road. 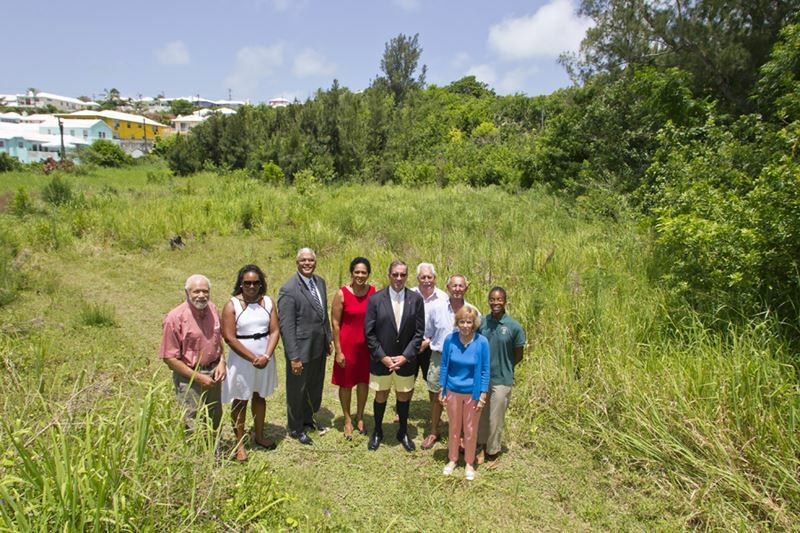 “Kuni Frith-Black and the Friends of Southlands are to be commended for spearheading this community garden and for your commitment to this property and your focus on the long term preservation and protection of this historic estate for future generations. Thank you! 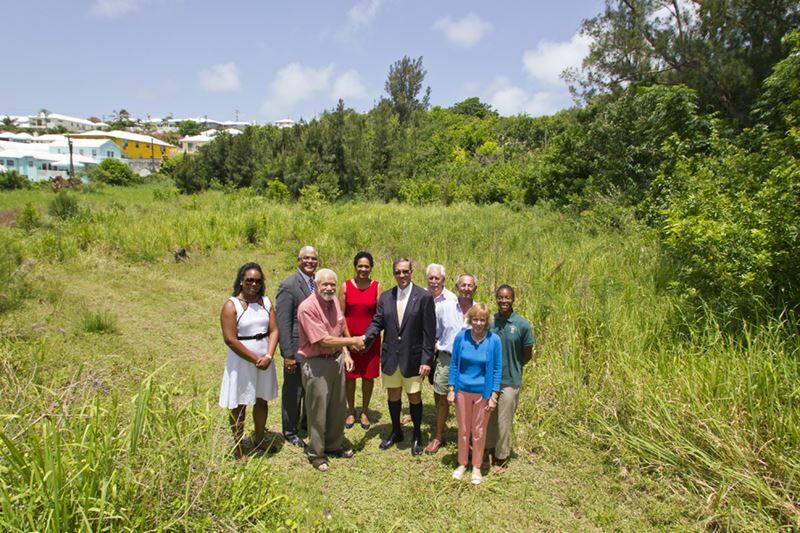 “The Bermuda Government and my Ministry remains committed to preserving the Southlands property for future generations and we extend our congratulations on this community garden,” Minister Cannonier added. The Premier and Public Works Minister were also joined today at the press conference by staff from the Department of Parks and BEST Chairman Stuart Hayward. Update 4.51pm: Speaking at today’s event, BEST Chairman Stuart Hayward said, “We are gathered here today because of the courage of the hundreds of people who worked hard, in one way or another, to save Southlands from development. “This is not to downplay the work of Parks and other government departments, or Mrs. Frith-Black and the Friends of Southlands, or your own team, Mr. Premier, but BEST feels compelled to remember and recognize all those who walked, marched, held vigils, sold t-shirts, did cleanups and spruce ups — all to preserve this beautiful property. “It’s been 8 years and counting, so we are pleased to reach this juncture, the launch of the Friends of Southlands Community Gardens venture. Bermuda has less than 400 acres of farmland being used for growing food. So any project that activates farming and helps develop food producers is to be welcomed. “Mr. Premier, I have been asked to present you with this Southlands t-shirt. We hope it will help keep the next step fresh in your memory. That next step is that in honour of all those who walked and worked to preserve Southlands, this property will in its entirety be added to the register of National public parklands. I hope that Mr CC now shows the same commitment to protecting another great Park – the Botanical Gardens which has a terrible sore that needs treatment: the new maintenance yard! And – it is his constituency! This is really getting old. What is it that needs protecting in the Botanical Gardens? The maintenance yard required for the Department of Parks vehicles and staff us being built on the site of the previous maintenance yard makes and results in zero change to the Botanical Gardens. This makes perfect sense. The maintenance yard has been expanded and ideally would’ve been best suited to Marsh Folly. any maintenance yard should not be in the middle of the Gardens – how many parks have a maintenance yard in the MIDDLE of them – they are all tucked away out of sight. The fact is that a chance was missed. He seems to be focuses on everything but his own contituency. Seems ironic rhat he’s supporting this but ignoring what happening right under his nose in the BG and the Premier sees the whole thing from Camden. Say what? Great timing,guess we could start with watermelons…. A good idea up if it isn’t properly regulated it’s going to be a bad for the environment. With all the chemical ferterliser on the market today who will regulate the people and say you can’t use this product or that one? I would love to see the government say that this will be strictly an organic garden. The idea of poisoning the land that they are trying to protect would be tragic. Agreed, there are better ways to farm that using anything ending in -cide. What is funny is that the “organic gardedning” of today is what generations before us simply called “gardening”. You can grow lots more without harmful chemicals. It is all about working with nature instead of against it. Just google bio-intensive or permaculture gardening. Both are excellenty suited for BDA and should be practiced at this new community garden. Well it’s about time, there are several large plots of arable land on the property which have gone unused for years, I hope the rental for a plot is reasonable (very low). The buildings seem to be purposely neglected, and actually the entire property has been since a well promoted clean up, how long ago. Many volunteers went in to clean up Southlands a year or so ago. It has been neglected since. How about the Parks Dept keeping it maintained for all of us Bermudians to enjoy. Last time I was there … there where loads of plants… for the forth coming hotel…. Every botanic garden in the world has a maintenance yard!! !This one will be unique in that it will service almost every national park in the island! The new neighbor has you all stuck on stupi. for his own personal gain! Yes, I am sure you are right – but how many have them in the MIDDLE of their Botanical Gardens?